This post is authored by Lirian Pádua, a Journalism graduate who works as a reporter, editor, and photographer and is volunteering for the NGO Batra (Bauru Transparente), a member of Amarribo Brasil’s network. 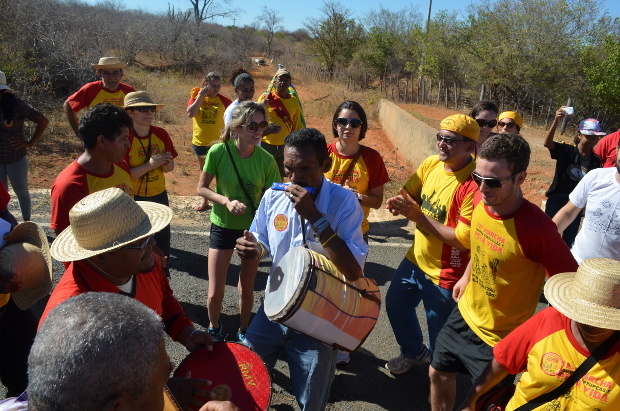 The 12th March against corruption that wound its way through the arid countryside of Piauí came to end a couple of weeks ago. Along the way in Jurema, Anísio de Abreu, São Braz and São Raimundo Nonato we checked up on public works and talked to people about how they can demand their rights from local government. In addition to this we also visited smaller communities where we saw the terrible problems people have to survive because of the lack of water, basic sanitation and poor public services. 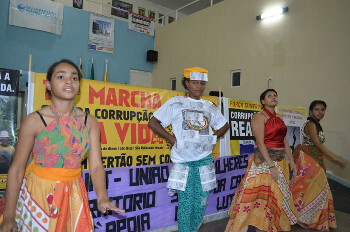 An anti-corruption dance by a Capoeira group. Last day of the march at Sao Raimundo Nonanto. Nevertheless, it’s not all sad in Piauí. During our journey we had the opportunity to get to know some exceptional people who, despite the tough climate, poverty and lack of public support remain very happy. They may have wrinkles because of their hard lives and the unpitying sun, but these people of the sertão always seem to be able to smile. 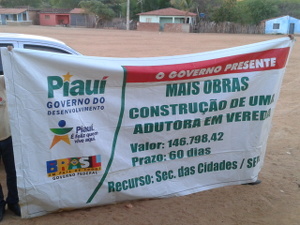 We found this at the party organised by the people of Novo Horizonte in the district of São Raimundo Nonato. As we reached the village we were welcomed by fireworks and music and even after our 16 kilometers on the road, their wonderful energy was contagious and we all started singing and dancing. More updates on the march. Part of the reason we marched was to confront the local governments with the issues about the lack of public works and the supply of water. We saw many building works that were either not finished or were not what had been planned. We went to the local government offices but many were shut. Municipio Veredas. Promised infrastructure that was not constructed. Now the Comptroller General is investigating. However, the Chief of the Regional Comptroller General of Piauí, Orlando Vieira de Castreo Jr, was very responsive to our claims. With us, he visited the community of Veredas and saw with his own eyes that people there didn’t have water despite the fact that they were promised access to water four years ago. The building works were supposed to be financed with federal resources but they were never finished. According to Mr. Vieira the evidence suggests that the funds could have been siphoned off. For this reason he wrote formally to the General Comprotoller in Brasilia to start a proper investigation into the case. Along the way we found many other examples of unfulfilled promises. In São Raimundo Nonato, in the village of Caldeirãozinho, for example, we met Maria de Oliveira Ribeiro, 81, who had two water tanks in front of her house. She told us that she and her family could only use about 100 litres of water between them each day for drinking, cooking and cleaning and this didn’t come from the tanks but rather a truck that only passed through the village once every three months. “This is the worst drought we have ever been through. We have no water for plants or animals,” she said. 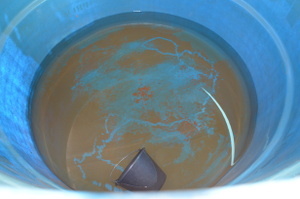 An empty tank of water.